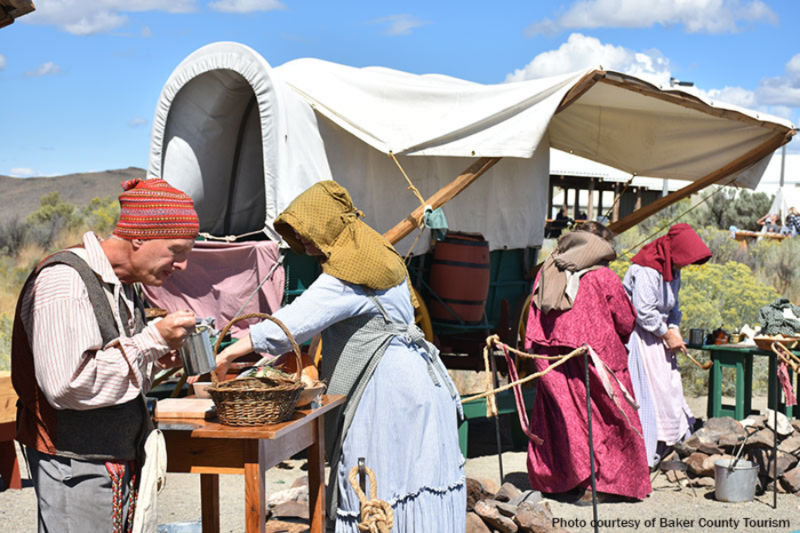 In 2018, the pioneer spirit comes alive in Oregon for the 175th commemoration of the Historic Oregon Trail. This famous wagon route, spanning 2,170 miles (3,490 km), was the largest migration in American history. 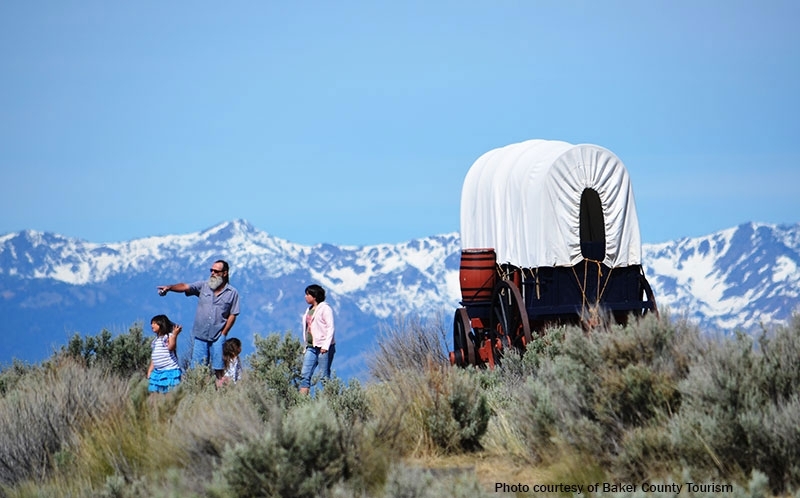 Join us as we rediscover Oregon from the perspective of those brave pioneers — while making your own Oregon Trail story along the way. The long, twisting Snake River was one of the most difficult passageways of the Oregon Trail. At the south side of the town of Nyssa, an interpretive shelter describes the treacherous Snake River Crossing and the trading post that sold supplies at exorbitant costs. From Highway 201, signs lead northwest to Keeney Pass, where you can walk along the trail’s original wagon ruts. 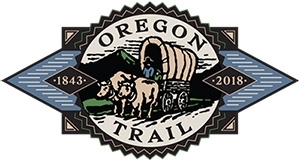 Continue to the town of Vale, the first stop in Oregon for settlers on the Oregon Trail. Take I-84 to Ontario and, if time allows, visit the Four Rivers Cultural Center, a museum depicting the region’s diverse cultures. Northwest of Ontario at exit 353 is Farewell Bend State Park and Birch Creek, famous as the point where pioneers left the Snake River after following it for 330 miles. All that adventuring can work up an appetite. Take a late lunch in Baker City, where the historic downtown is perfect for a self-guided culinary walking tour. Spend the night at Geiser Grand Hotel, built in the 1880s as a hotel for rich miners, and admire its original furnishings, such as its large stained glass ceiling. 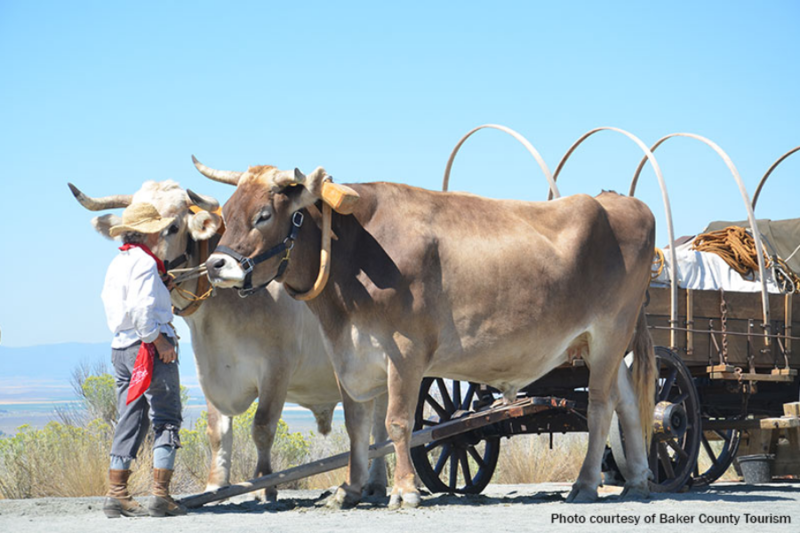 Pack a wagon and experience stories from the trail at the 500-acre National Historic Oregon Trail Interpretive Center. A 2.5-mile walking trail loops through the area with stops at authentic wagon ruts, remnants of the Flagstaff Gold Mine and a former wagon encampment. Stop in La Grande at Side A Brewing, set in a historic fire house to fuel you for the next leg of the journey. The steep hillsides of the Blue Mountains can leave you awestruck. See where Oregon Trail emigrants camped after the first climb at Hilgard Junction State Park. 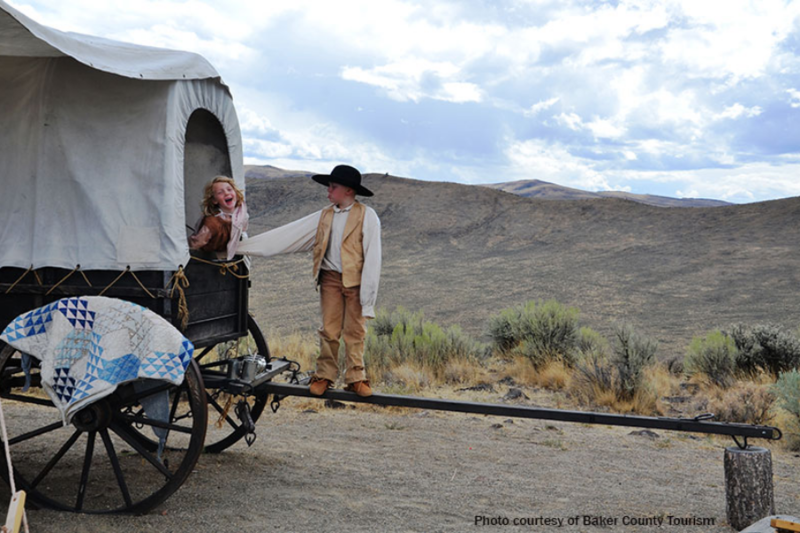 At exit 248, walk in the footsteps of pioneers at the Oregon Trail Interpretive Park at Blue Mountain Crossing, featuring some of the best-preserved traces of the trail. Enjoy dinner at Hamley’s Steakhouse, with a menu boasting everything from old Western comfort food to high-end Northwest cuisine. Rest your cowboy hat at Red Lion, Oxford Inn & Suites or Hampton Hotel. 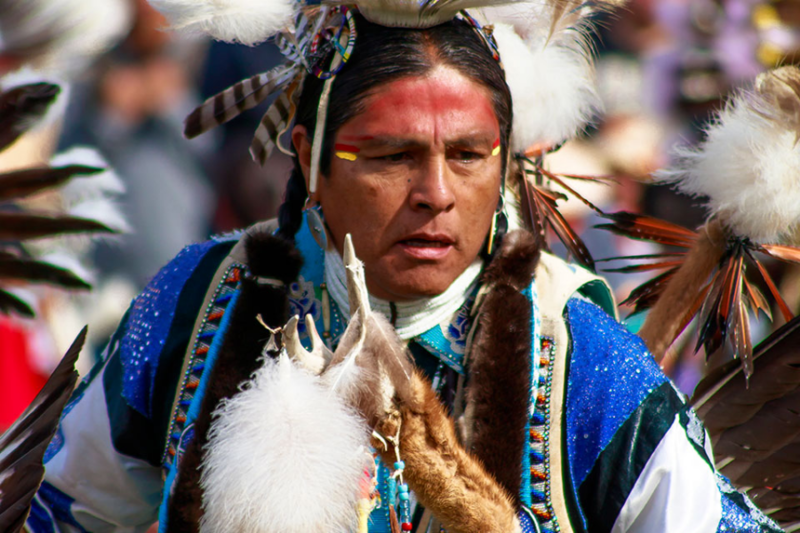 For a deep dive into Native American culture, begin today with a visit to the Tamástslikt Cultural Institute in Pendleton, the only museum located along the Oregon Trail that documents how the arrival of settlers forever changed tribal life. Enjoy lunch at the Kinship Café which offers a variety of tribally-inspired foods. No visit to Pendleton is complete without a tour of the original Pendleton Woolen Mills, family-owned for 153 years. Walk through the showroom piled high with brightly colored blankets and shirts, and marvel at the wool spinning into fabric on looms. You’ll find rodeo-ready gear at Hamley & Co., famous since 1905 for making the “best saddles a man can ride.” Shop at the other hand-made workshops and stores throughout downtown. End the day with dinner at the first craft brewery in Pendleton, The Prodigal Son. Spend a second night in Pendleton. You’ve earned it. Swing into The Great Pacific Wine and Coffee Co., located in an old Masonic Lodge, to get a coffee or espresso before hitting the road. In Boardman, stop at the SAGE Center which highlights the history of the area’s sustainable agriculture and energy. And make sure to stop and take in the many great views along the road. Head to The Dalles to grab lunch at Clock Tower Ales, located in an 1883 courthouse. 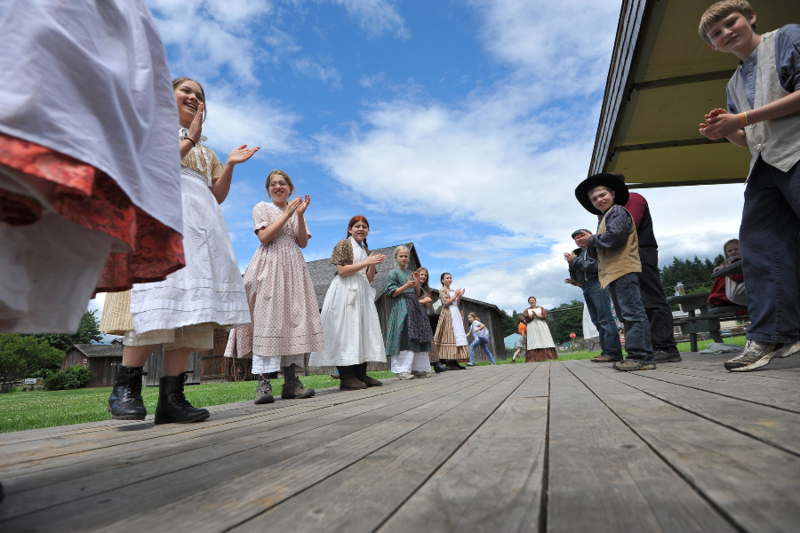 Next, Fort Dalles and Anderson Homestead is your opportunity to see pioneer artifacts and antique wagons. 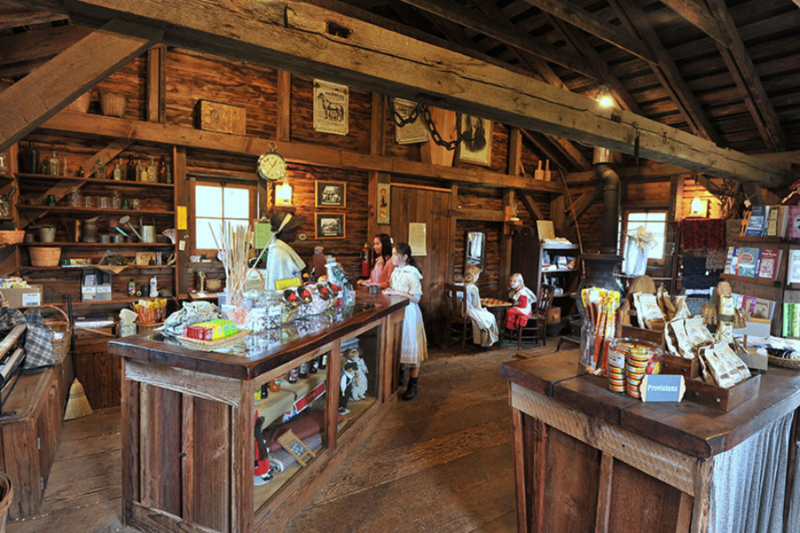 The former military fort is one of Oregon’s oldest history museums. Check into Shilo Inn before heading west to Cascade Locks for a dinner cruise aboard the Columbia Gorge Sternwheeler (spring-fall). From the ship deck you can sip a beverage and listen to the captain narrate some of the region’s landmarks and history. After breakfast at the hotel, visit the Columbia Gorge Discovery Center for a specialized program with interpretive staff. Take the Historic Columbia River Highway to Rowena Crest for a nature walk that reveals stunning views of the gorge and famous Rowena Curves. Next travel to Dufur, a historic town with plenty of charm. Visit the Dufur Historical Society to learn about the town’s first residents, then stop by the historic Balch Hotel for lunch and a history talk. Nearby White River Falls is a worthy detour. As an alternative to the risky trip down the Columbia River, Barlow Road, a toll road, was built in 1846 as the last overland stretch of the Oregon Trail. Today you can drive U.S. Route 26 from Government Camp to Sandy, which follows a segment of the historic road. Explore sections of the original wagon route at the Barlow Pass Trailhead. Take in the views at the historic Timberline Lodge, a classic mountain hotel built in the 1930s, with carved railings and doors as well as other art from the period. Enjoy dinner at one of the lodge’s farm-to-table restaurants. Spend the night at The Resort at the Mountain in Welches. 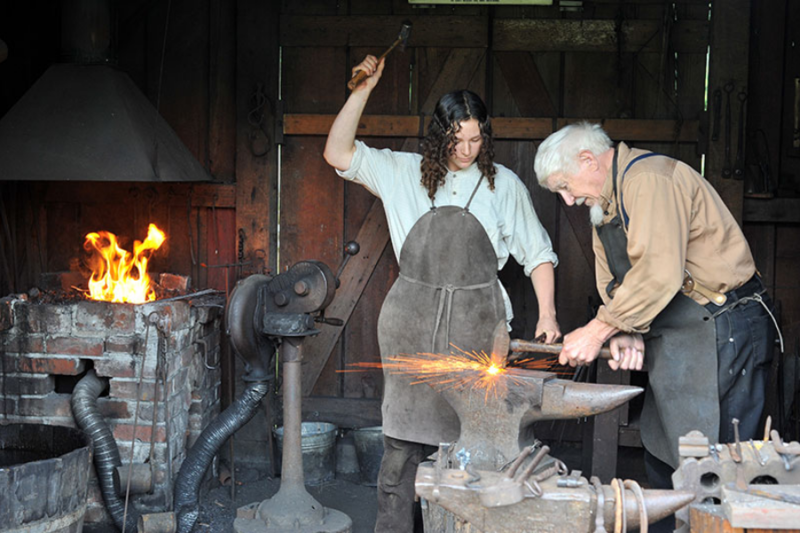 Following breakfast at the resort, drive to Philip Foster Farm, the last overnight stop on the Oregon Trail, for a hands-on experience of pioneer history. 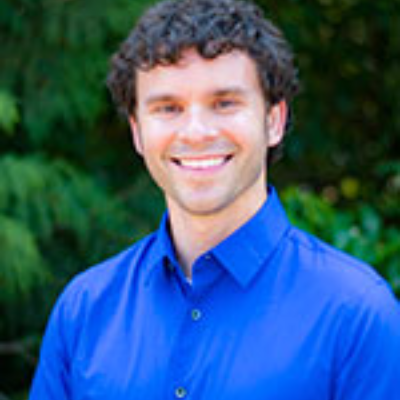 The plot thickens in Oregon City, where trail travelers received land assignments. Immerse yourself in stories at the End of the Oregon Trail Interpretive Center, where Dr. John McLoughlin will welcome your group. 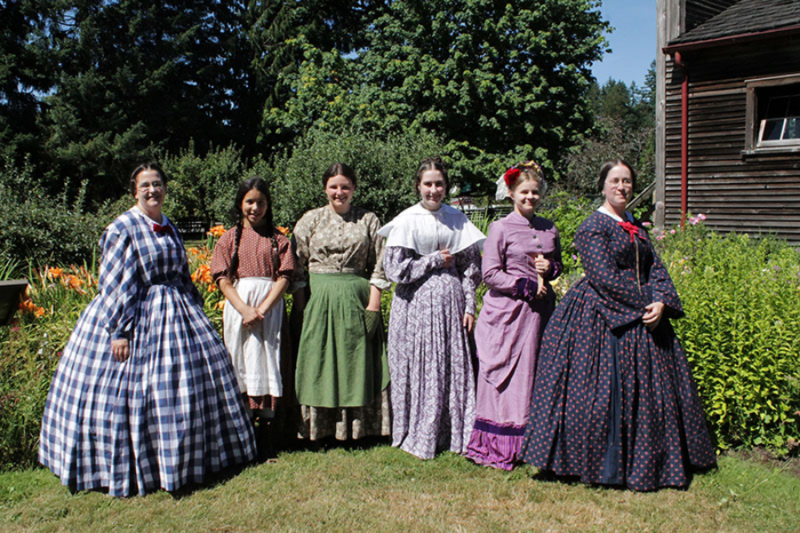 Then visit the Museum of the Oregon Territory to see the original land plat of San Francisco and views of Willamette Falls. For a different perspective of the falls, visit eNRG Kayaking and rent your choice of kayak, stand-up paddleboard (SUP) or canoe and experience the history of Oregon City from the water. Finish the day shopping the vintage and resale shops of Main Street Oregon City. Refresh with a themed beer at Oregon City Brewing, where they embrace a modern twist of the Oregon Trail. End the day at Best Western Plus - Rivershore. 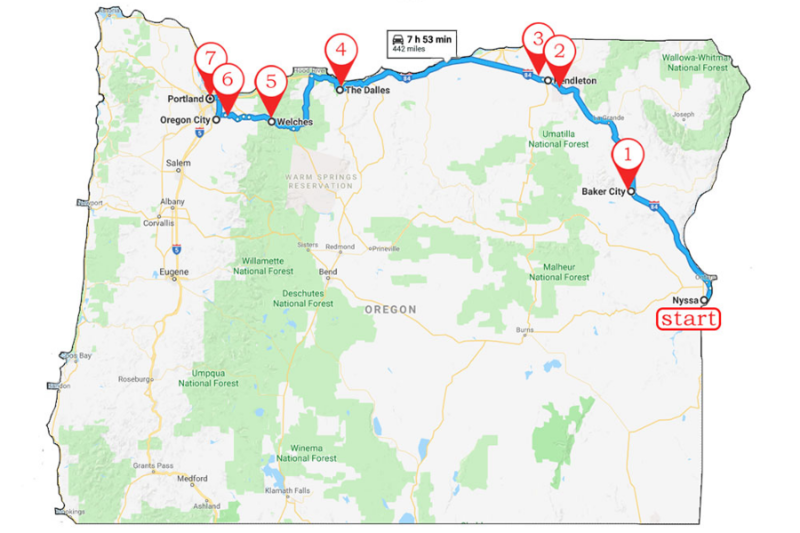 Tomorrow you'll head to Portland, or if you want another Oregon Trail adventure, head south to find the Applegate Trail. Head north to Portland, where you will connect with the new pioneers of this quirky city — the movers and shakers of the famous DIY culture. Stop at Jacobsen Salt to sample varieties of hand-harvested sea salt from the Oregon Coast. Around the corner, step inside Alma Chocolate to taste the creations of talented chocolatiers. Make your way to ADX, a collaborative space at the center of Portland’s crafty maker movement, and watch local woodmakers, jewelers and designers at work. Now that your senses are stimulated, go to DIY BAR. Here you can unleash your inner artist and create the ultimate Oregon souvenir — all while sipping local wine, cider and beer. Finish the evening with a stop at one of Portland’s famous food cart pods, where you can indulge in a diverse selection of delicious and affordable street food. At Smith Teamaker’s newly expanded tasting room, you can sip a range of premium teas and tea lattes while watching the packagers at work. Looking for a tasty souvenir? Creo Chocolate offers factory tours and the opportunity to make your own chocolate bar.